Trees are barren and brown since winter is on its way! These little birds are still busy eating as much as they can find. That moment of inspiration hit when I heard the noises of these little birds on this tree. I rarely take out my camera anymore but once in a while it hits. 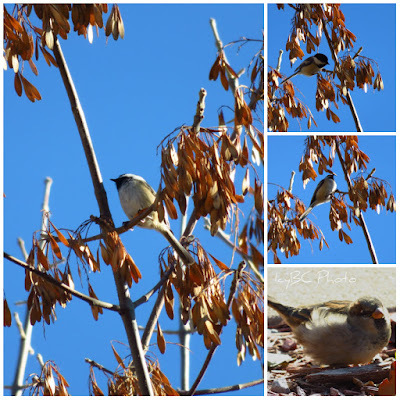 For some reasons these little birds love the seedings of this tree, and they got in feeding frenzy! Wishing everyone an early great THANKSGIVING! Great collection of birds and images. With the trees bare now,it will be easier to see the birds. Happy weekend! Great shots! Happy Thanksgiving to you and family! We celebrate Thanksgiving early October in Canada. Your little bird pictures are pretty good. I'm pretty sure the birds are male house sparrows. I haven't seen any since I lived in Michigan. Nice pics. well made collage! Oh they are adorable and what a treat to see them in these Winter branches. It is nice to see you virtually. And thank you for you best wishes.